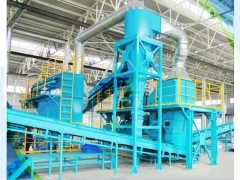 The HC Spiral conveyor is mainly used for conveying solid materials in solid waste recycling line like MSW recycling line, plastic recycling line, tire recycling line and wood recycling line. Anti-winding, without interference from shaft, suitable for conveying banding and easy to winding materials, good at avoids accidents caused by blocking. 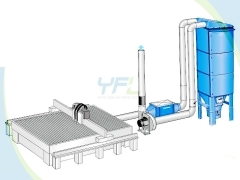 Good environmental performance, keeps the surroundings clean and no pollution to the conveying materials and no leakage of the conveying materials, as the conveying space is entirely sealed and the spiral surface is easy to clean. 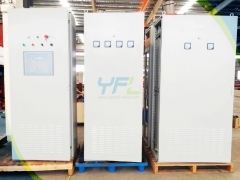 Large torque and low energy consumption. As there is no shaft in the spiral conveyor, the materials are hard to be blocked, thus it can run in a low speed and reduce energy consumption. 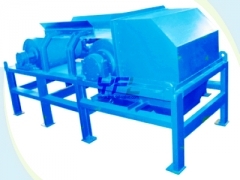 Strong conveying capacity, 1.5 times capacity of the traditional conveyor with shaft in same diameter. The fastest speed of the spiral conveyor is 40 m3 /h. 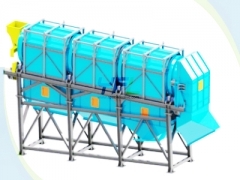 Its conveying distance is up to 25 m. According to customer's requirements, it can be designed into series connected installation style, which allows long distance delivery. 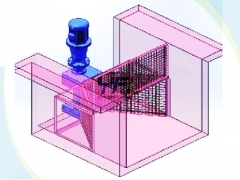 Compact structure and easy to operate, economical and durable, low maintenance cost. 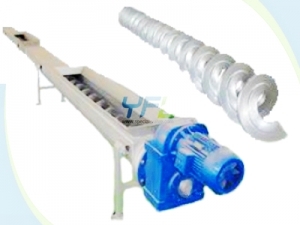 The HC spiral conveyor is with suspension bearing but without shaft, so there will be no problem of materials blocking. The HC spiral conveyor is totally sealed so there will be no leakage of conveying materials and no pollution to the conveying materials.